Here’s what we’re commonly asked about FuseIt Tape™. It works good. Did you see this page? Keep it out of direct sunlight (which cures the tape) and at at a normal indoor room temperature. 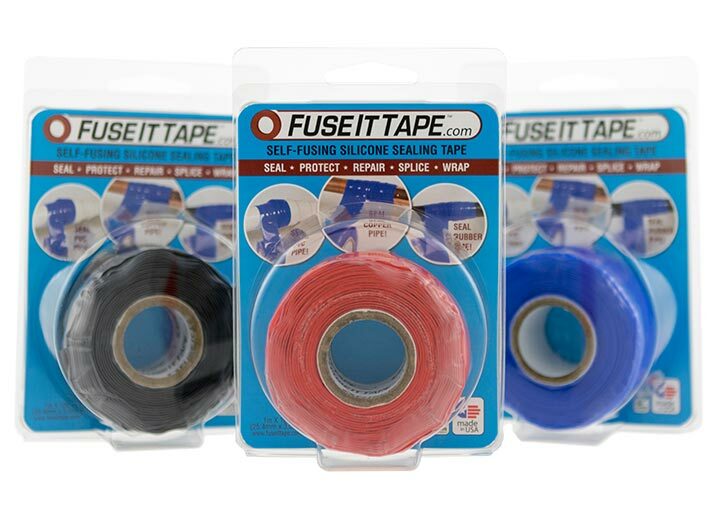 Provided you keep it out of direct sunlight (which cures the tape) and at at a normal indoor room temperature, FuseIt Tape™ will likely last longer than you. Simply cut it, using your preferred cutting method of choice. You’ll find it comes off easily and with zero sticky mess. Yes. You can even apply it underwater, if you’re feeling adventurous. What are the product specs and physical properties? See the bottom of this page for technical details. Are there discounts for high-quantity orders? Naturally. Call Estco Enterprises at (888) 696-7826. How can my company become a distributor? See our page for distributors. Can FuseIt Tape be used to seal high-pressure hoses? Don’t be a fool! Just because you can use self-fusing tape on high-pressure hoses, doesn’t really imply that you should. We found a testimonial for a competitor’s tape on YouTube in which a person claims to have used self-fusing tape on high-pressure hoses – underwater and at depth. While the experiment was a hell of a lot of fun, the results were a complete failure – using both our competitor’s thinner tape and our thicker tape. Look: We suppose anything is possible. For example, if the tank’s valve was turned off, and dozens of wraps were made around the punctured hose to the point of a ridiculous thickness, it might work. But this is not exactly practical or safe to do underwater – let alone anywhere else! For a practical solution to sealing high-pressure hoses: We simply advise not to use any self-fusing tape, especially in cases where safety is a factor. This is not what this tape is designed for. Note: Shelf life is defined as the duration of time for which the product will meet the physical characteristics outlined on this page. It does not guarantee the product’s usefulness in all applications.